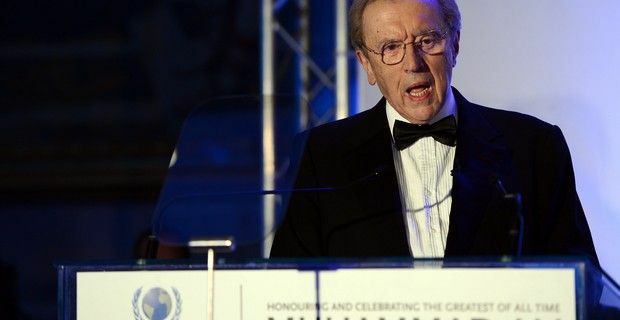 Sir David Frost, 74, the veteran broadcaster has died of a heart attack while he was aboard the Queen Elizabeth cruise ship. Frost, probably best known for his riveting 1977 interviews with former President Richard Nixon, passed away on Saturday. Sir David’s career spanned 50-years and included not only top notch journalism, but also comedy writing, and he was also a media personality and daytime TV game show host. For the BBC, he hosted the Sunday morning interview program Breakfast with Frost from 1993 to 2005. He spent two decades as host of Through the Keyhole and from 2006 to 2012 he hosted the weekly program Frost Over the World on Al Jazeera English, and The Frost Interview. However, it was his five 90-minute interviews with former President Nixon that catapulted the British journalist into the international limelight, when he was able to draw an apology from President Nixon over the Watergate scandal. Frost was the only person to have interviewed eight British Prime M inisters that served between 1964 and 2010 (Harold Wilson, Edward Heath, James Callaghan, Margaret Thatcher, John Major, Tony Blair, Gordon Brown and David Cameron) and seven US presidents in office between 1969 and 2008 (Richard Nixon, Gerald Ford, Jimmy Carter, Ronald Reagan, George H. W. Bush, Bill Clinton and George W. Bush). In 2007, the Nixon interviews made into a movie, "Frost/Nixon” directed by Ron Howard, and starred Michael Sheen and Frank Langella. The film received five Golden Globe nominations and five Oscar nominations. A statement from his family and released to the BBC read: "His family are devastated and ask for privacy at this difficult time. A family funeral will be held in the near future and details of a memorial service will be announced in due course." On hearing the news of Frost’s death, Prime Minister David Cameron tweeted: "My heart goes out to David Frost's family. He could be – and certainly was with me – both a friend and a fearsome interviewer." "He had an extraordinary ability to draw out the interviewee, knew exactly where the real story lay and how to get at it," said former Prime Minister Tony Blair, adding, "he was also a thoroughly kind and good-natured man."